For our megalithic tour, we have the opportunity to use some of the latest hi-tech equipment: an Apple PowerBook G3 laptop computer to store and enhance digital images, update these Web pages and get connected to the Internet; a special panoramic head to help us building the QTVR virtual scenes; a new (and light weight) Manfrotto carbon-fibre tripod and an excellent Olympus digital camera to share with you the images of the best prehistoric sites of Apulia. Of course, we are also carrying with us some other "friends": Nikon F3 and F100 cameras, an array of Nikkor lenses, a medium-format Pentax 67 II camera along with 45mm and 90mm lenses, and about 70 Fujichrome Velvia 50 and Kodak Royal Gold 100 film rolls. While on Tour, our Internet connection will be provided by Tiscalinet and we will use a Port Acousticoupler 100 to connect our laptop's modem to any kind of phone, including pay phones. A very special thanks to Stefano Traldi (Polyphoto/Olympus Italia). 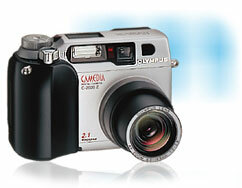 The 2.1 megapixel Olympus C-2020ZOOM camera is the second model in the C-2000ZOOM series and impresses with a host of remarkable features. Not only does it offer options such as manual focusing, exposure and the ability to take black and white photos, but it is also the first Camedia camera that can shoot video sequences. Employing QuickTime Motion JPEG capability, it is able to produce video shots at 15 frames/sec. with a resolution of 160 x 120 pixels lasting up to 60 seconds. Giving the photographer even greater control over the final result, the C-2020ZOOM includes a 130 step manual focus system that covers any distance between 0.2 and infinity while a manual exposure, slow synchronisation and a shutter speed reaching to 16 seconds, add to the creative possibilities. Thanks to the sepia and black and white modes, interesting monochrome results can be achieved. A blackboard/whiteboard mode is also available. The 3x optical zoom camera is equipped with auto bracketing - this automatically shoots images in several different exposures to guarantee the best results in difficult light conditions. An intelligent ESP (selective multi-zone) auto white balance system also deliver excellent colour accuracy. The advanced sequence shooting mode allows up to 49 shots to be taken at 1.4 frames per second. Compatible with 64 MB SmartMedia cards, the C2020ZOOM measures 107.5 (W) x 73.8 (H) x 66.4 (D) mm and wheighs 305 g (excluding batteries and card).